Designer style: Good looking yet easy to build, Murph's models have a simpler design focusing on external details and minimal internal framework. The resulting models are beautiful and accurate as seen on the pictures. The instructions are easy to understand 3D drawings. When printing, the pages scale to fit Letter format. The Fairchild C-123 Provider is an American military transport aircraft designed by Chase Aircraft and subsequently built by Fairchild Aircraft for the United States Air Force. In addition to its USAF service, which included later service with the Air Force Reserve and Air National Guard, it also went on to serve most notably with the United States Coast Guard and various air forces in South East Asia. During the Vietnam War, the aircraft was used to spray Agent Orange. 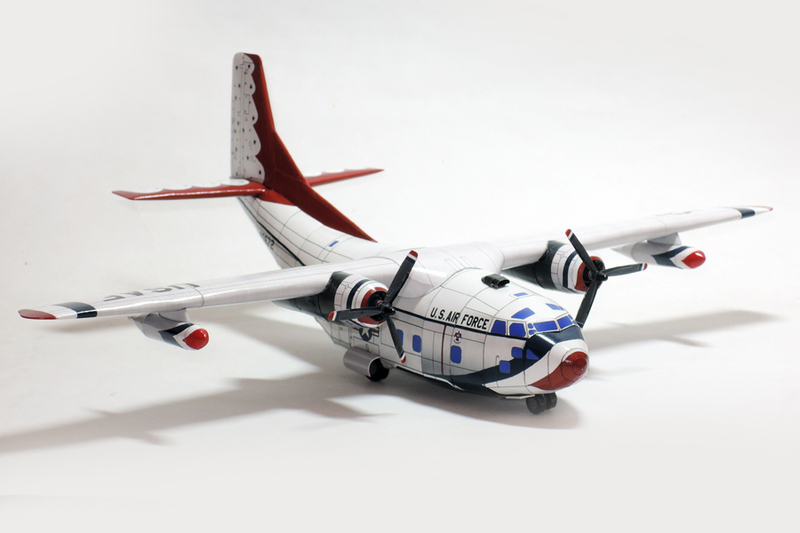 The first recipients of C-123 aircraft were USAF transport units, soon followed by the United States Coast Guard (USCG) who used the aircraft for search and rescue missions, and even the U.S. Air Force Demonstration Team, the "Thunderbirds," would use C-123s for a time as a logistics support aircraft for transporting the team’s ground crews and equipment. The type would also be widely exported under various U.S. military assistance programs, directly from USAF stocks. A C-123 was used to transport President John F. Kennedy’s limousine during his November, 1963, Texas tour. Consider donating to support us. Every donation greatly helps the store and the creation of new designs.